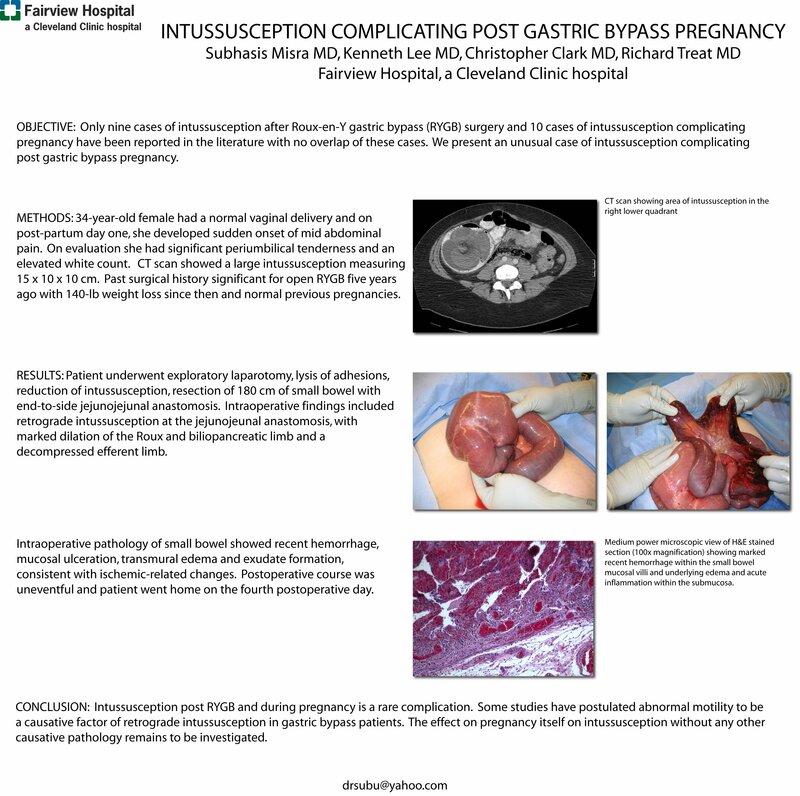 OBJECTIVE: Only 10 cases of intussusception after Roux-en-Y gastric bypass (RYGB) surgery and 11 cases of intussusception complicating pregnancy have been reported in the literature with one previous case common to both groups. We present an unusual case of intussusception complicating pregnancy following open RYGB. METHODS: 34-year-old female had a normal vaginal delivery at full term and on post-partum day one, she developed sudden onset of mid abdominal pain. On evaluation she had significant periumbilical tenderness but no peritoneal signs and an elevated white count. CT scan showed a large intussusception measuring 15 x 10 x 10 cm. Past surgical history significant for open RYGB five years earlier with subsequent 140-lb weight loss and normal previous pregnancies after gastric bypass. RESULTS: The patient underwent exploratory laparotomy, lysis of adhesions, reduction of intussusception and resection of 180 cm of small bowel with end-to-side jejunojejunal anastomosis. Intraoperative findings included retrograde intussusception at the jejunojeunal anastomosis, with marked dilation of the Roux and biliopancreatic limb and a decompressed efferent limb. The incarcerated small intestine within the intussusception appeared to have ischemic injury. Intraoperative pathology of small bowel showed recent hemorrhage, mucosal ulceration, transmural edema and exudate formation, consistent with ischemic-related changes. Postoperative course was uneventful and the patient went home on the fourth postoperative day. CONCLUSION: Intussusception following RYGB and during pregnancy is a rare complication. Some studies have postulated abnormal motility to be a causative factor of retrograde intussusception in gastric bypass patients. Pregnancy following RYGB is speculated to cause intussusception due to altered anatomic relationships secondary to a growing uterus. The effect of pregnancy itself on intussusception needs to be further investigated with hormonal changes possibly playing a role.